I always forget to take any good shots, so here's another angle of Veg's last one. 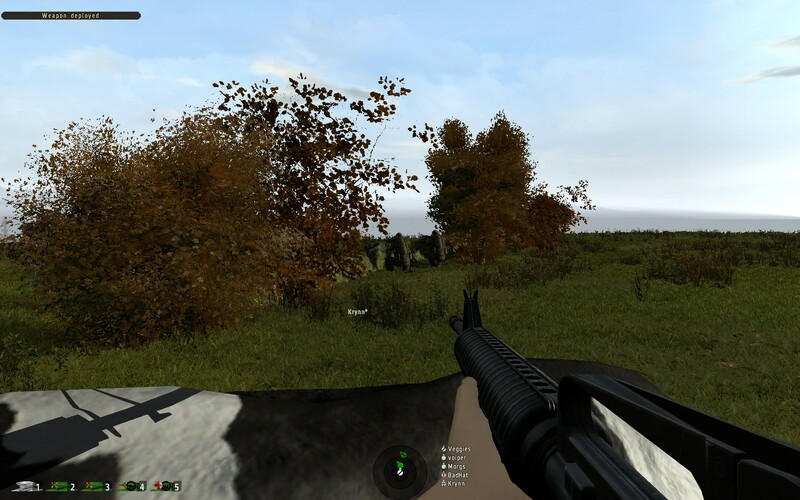 Resting my gun on a cow. This screenshot makes the game's graphics look so terrible. Thanks in large part due to your melanin starved character model you use. Also the gun model is really low poly compared to most guns I think. I thought it was the original Operation Flashpoint for a minute there! Loving the Beat Hazard Ultra. No Frosted! You're playing at the wrong 3d res. Change it to your monitor's res! Interface and 3d resolution should be the same. Still really bad at remembering to snap any shots during our games, but here's a jet crashing. hmmm unless they've fixed it I would have told people to stay away....it's multiplayer only and last time I checked the community was completely dead and not enough servers was around. I haven't played L&G recently, but a few months ago there were a few completely lag free dedicated servers with regular players. The difference this makes compared to the laggy player hosted crap we got before is huge. Frosted, I bought the R6RV pack on Steam during the summer sale. All it does is make me wish the original R6 and Rogue Spear were Windows 7 compatible. Having Ravenshield on Steam more than makes up for the travesties that are the Vegas series and Lockdown that are on Steam, I think. Also, you can get R6 on GOG. Ravenshield is on Steam?! That was just the demo. My day has been made. Bought the original Vegas on xbox mainly for the college campus terrorist hunt maps. P sure that was the only good part of the game. EDIT: Lockdown and Critical Hour were complete trash, the Vegas series is somewhat tolerable, but it shouldn't be going under the R6 name. R6 is finished, tactical arcade shooters are all that remains. 1000 Wins+ 936 Losses+ 4 Quits = 1940! P.S. Sorry, I know you were probably aware of this, but I couldn't resist teasing you. I have several smurf accounts, dozens of practice games, and games that were nullified by server crashes. It's well over 2000, but 1k wins is a better representation. Master sergeant driver person! What game is that? Looks like GRiD to me! I don't take screenshots since still screens of racing games are boring (even though this game is beautiful and runs great on my old 5770, with 1920x1200 resolution and 4x AA, with high settings) so I made this gif. I am still waiting for a demo of DiRT3 before deciding to buy it myself. They ****ed up the handling with DiRT2 but I'm hoping they improved it with DiRT3. We tested Viper's Speed mission some more. Still running into issues, but at least it's not lacking for explosives! Time for a small series of my screenshots. from Metalheart and Azrael' Tear. MH is a Russian cRPG with an interesting setting, but absolutely abysmal English translation. It is truly horrible, as you can probably see on the screens. Azrael's Tear... Well, it speaks for itself. Holy Crap! I guess it has its own 100 feathers? Nope, the 100 is the total for the entire game. I don't think I've found more than, like, 10-15 in the districts I've unlocked so far, they're pretty spaced out. Camo facepaint is standard business attire in Takistan. Fun mission, we'll have to play it next time. That's what I'd imagine the real life M.I.B would look like.